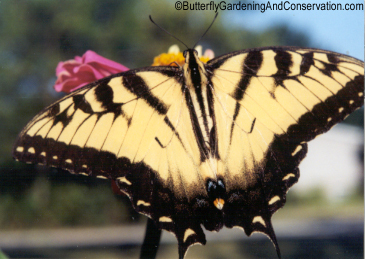 Tiger Swallowtails are one of my most favorite butterflies! 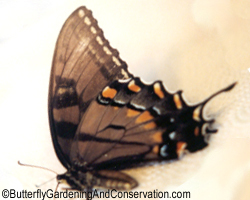 They are very large butterflies, with a wingspan of 2.5 - 4.5 inches, and black and yellow striped wings. 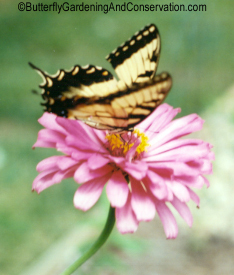 An adult Tiger Swallowtail nectaring at a Zinnia. Hop Tree/Wafer Ash - Ptelea trifoliata. Tiger Swallowtail eggs are green and kind of shiny. They are spherical (ball like) with a diameter of little over one millimeter. The female will lay its eggs singly on the host plant leaves. It can as many as 7 days for the eggs to hatch. It tends to take longer if the weather is cooler. When the eggs are close to hatching they will turn a orangish/yellowish color. 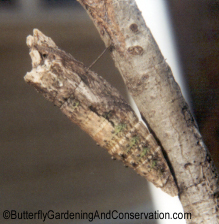 The caterpillars chew their way out of the egg and after they hatch they eat what is left of the egg. 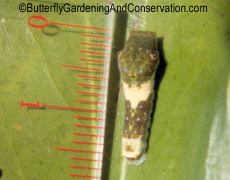 First instar caterpillars range from around 3 mm, right after hatching, to about 5mm. They are a dark brown color with a white band around their middle. The one in the picture on the right just recently hatched, what is left of its egg is still visible in the picture, as it is still in the process of eating it. These pictures are of the same caterpillar, likely still first instar, one from the top the other a side view. This caterpillar, likely a second instar, just molted and its old skin can still be seen laying behind it. 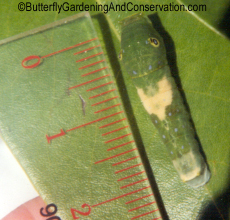 Second instar Tiger Swallowtails caterpillars don't look much different from 1st instar. There are still dark brown with a white/off white band around their middle and have a number of small blue dots along their bodies. They also have a white/off white patch on their last two segments. This patch changes its appearance a bit as their skin stretches, developing a brownish color in the middle of it. 3rd instar (possibly 2nd) from top, notice its skin is kind of shiny. 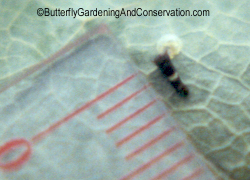 The blue spots can be seen on this 2nd/3rd instar picture. This 2nd/3rd instar is close to molting again. Also notice its prolegs are white. Later instar Tiger Swallowtails are a dark green color and their fake eyespots show at this point. This is an early 4th instar (or possibly a late third instar caterpillar). 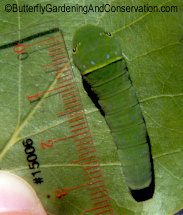 Fourth instar caterpillars are a lighter green color. They still retain the white/off white band around their middle and the fake eyespot is even easier to see. Forth instar stretched out while eating. Notice its face/head capsule is a pinkish color. 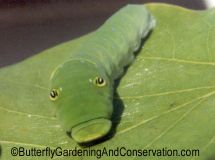 Most caterpillars tend to kind of scrunch up when resting making them appear to not be as long and when they are stretched out. 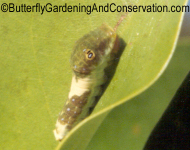 Tiger Swallowtail caterpillar resting on leaf in silk nest. 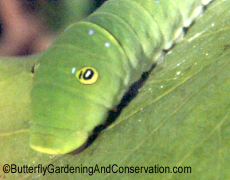 Tiger Swallowtail caterpillars usually make a little nest of silk on a leaf to rest in. It causes the leaf to curl up a little, but not to completely curl up. Fifth instar does not have the white band around its middle or the light colored patch on its last segments. They do have a yellowish ring around their 'neck-like' area. They also have a black band running parallel to the yellow one. Usually it can't be seen unless they have their body curved in a certain way. Fifthh instar, not quite full grown. They get to be about 4 or so cm long before they pupate. The black band next to the yellow band can be seen in this picture. I included these first two pictures, taken at different angles, because their fake eyespots are cool looking, especially at some angles. Notice, especially in the first pictures how its head is tucked way under so that you can't see its head capsule. The third picture is a close up of the fake eye spot, notice it kind of looks like a number '10'. 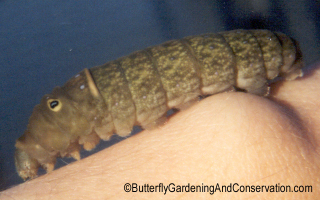 This ready to pupate fifth instar is crawling on my wrist in this picture. 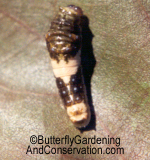 When Tiger Swallowtails get ready to pupate they turn a dark brown color, with some lighter colored speckles. Notice the fake eye spots are still visible, as is the yellow 'neck band'. 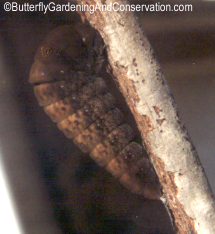 Its face/head capsule and prolegs also turn brown. 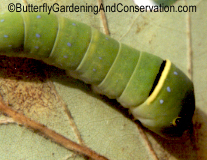 Tiger Swallowtails generally attach themselves to a stick, like other swallowtails do, to pupate. The lighting didn't turn out to well in this picture of a Tiger Swallowtail caterpillar already attached to a stick and starting to pupate. It hasn't done its last molt yet. 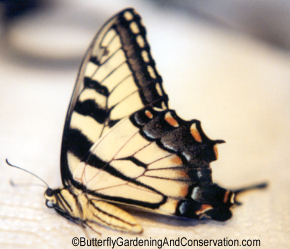 Adult male Tiger Swallowtail butterflies are yellow and black striped. Females come in two forms. A yellow form that looks a lot like the male but with more blue on its wings, and a dark form that mimics the Pipevine Swallowtail. Yellow form adult female Tiger Swallowtail. 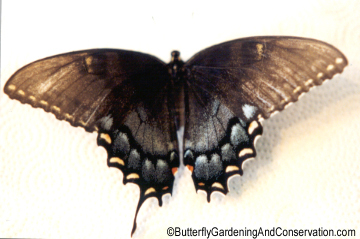 Black form adult female Tiger Swallowtail. An adult from the side. An adult black form female from the side. Notice the pattern of black stripes is the same as yellow adults. They can be seen more easily from side views than when its wings are open. 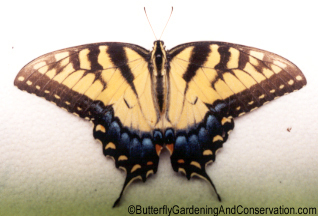 Great items with Tiger Swallowtail images on them available now from my Cafepress store! This design available on t-shirts, magnets, framed tiles, coasters, mugs, and calendar!